fototazo: The Image: Barry W. Hughes, from the series "Didaktik"
The Image: Barry W. Hughes, from the series "Didaktik"
Barry W. Hughes, from the series "Didaktik"
It was a very hot summer, I was turning 30 and it was my first trip to Berlin. I wanted to see work I had in an exhibition there and my girlfriend wanted to visit a friend. We had been together for around seven years but we weren’t getting along very well any more, and we were hoping this trip would help. I had a limp from a fall at my girlfriend’s brother’s wedding a fortnight before (I knew she was still annoyed at my being driven in an ambulance from the wedding hotel at 6am), and the oppressive heat didn’t make matters better. We were both tired. The night of my exhibition opening, on the other side of the district, I managed to score some weed from a couple of kids outside the exhibition. I figured I may as well get high for a few days if all I was going to do was walk around with this stupid limp after my girlfriend and her friend. A couple of days later, my girlfriend had been booked into her friend’s gallery / bar to sing some of her songs and play guitar. Knowing that they wanted time to themselves, I suggested I stay behind while she went to prepare for the gig. So I rolled a joint and just sat there in silence watching the light dim in the room. Cleaning up in the kitchen I noticed the light again on the round pale toned plates sitting atop the black circular hob of the cooker and it reminded me of the light in Dutch Still Life painting, or a Tillmans photo. I added the fruit I had bought that morning and I rearranged the objects so the circular motif carried through the picture in a triangular fashion. 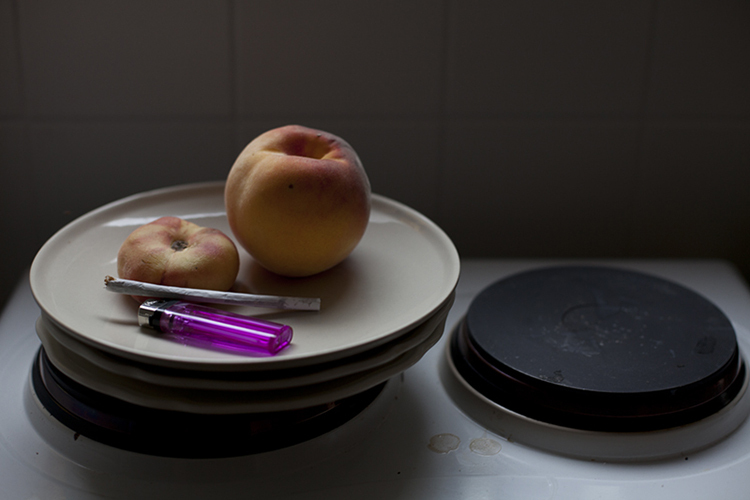 At first I was playing with the objects, their shape, colour and the light; then realising I had this joint and lighter in my hand I added those too, which ended up creating a much more interesting and authentic Still Life. It took a few minutes to get the bright pink lighter in the right place for the light to come through properly, and I particularly liked the contrast in surfaces of the soft fruit, the hard plates and hob with the transparency of the joint’s skin and the lighter. After taking the shot and smoking the joint I walked to the gig and collapsed with a beer in hand, still sweating from the heat. I remember feeling satisfied with the photo I had just taken. Looking at it now the Still Life seems to be a metaphor for that episode in our relationship. Five months later my girlfriend and I had split up for good. One of the last photos I took of her, was from behind as she walked away from me, in that same Berlin apartment.